Lombardo’s is a premier conference and wedding venue located in Randolph that has been entertaining guests for more than fifty years. Vincent Lombardo is the CEO, Paula Lombardo is the CAO, Dennis Lombardo is the CFO, David Lombardo is the general manager, Francesca Lombardo is the creative marketing director, and David Barros is the CTO. Who started this family business and what was it like growing up in it? Vincent Lombardo Sr. set the foundation for the family business when he opened a meat market, in 1927. That shop would later grow into a supermarket chain and then a conference and wedding venue in two locations. So, really this is a 90 year old, fourth generation family business. The third generation members of the business grew up working at the supermarket, bagging everything from chickens to produce, and in the venue, from bartending to dishwashing. The fourth generation family members started out in internships, or small part-time jobs. As kids, we grew up always being around our family at the supermarket and East Boston venue. 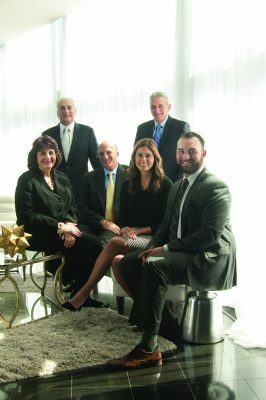 Other family members who work in the business not pictured include Jessica Lombardo Bigge (Financial Administrator) and Nina Lombardo Barros (Shareholder). We’re located 12 miles south of Boston and our primary clientele comes from the nearby South Shore communities. From a community standpoint, we’re a big part of the history of many local families. People who book corporate events here remember coming here for parties as children. We’ve become a pillar of the community. We’ve overcome a lot of the pitfalls that many multigeneration businesses experience. Only some three percent of businesses make it to a fourth generation and beyond. I think part of the reason for our success is that we’re a very close family. We all have specific jobs and everyone is held responsible. Our grandfather who started the business always used to say that if the business was going to come between the family, the business would be sold immediately. In the end, the family unit is the most important thing. We’re crazy, but we do go on vacation together. We’re very close outside of the business. We all love to play golf. The day after Thanksgiving we have a big family bowling tournament. On Sundays during the season you can find us all tailgating at the Patriots game.